Thousands of Bulgarians have demonstrated for the government to resign for days in a row. Nearly 10,000 people have joined rallies in Sofia nightly since June 14. On Friday, European Commission President Jose Manuel Barroso expressed concern over political developments and the rule of law in Bulgaria after protests followed the appointment, since withdrawn, of a media mogul as the country's national security chief. Though the protests began in reaction to that appointment, they have turned into demonstrations against the Socialist-backed government and politicians in general. "We demand that the oligarchy resign from political office so that Bulgaria can conform to European Union standards," organizers of the rally wrote on Facebook. Barroso highlighted the appointment of media mogul Delyan Peevski, who lacked experience in security matters, to head of the state agency DANS. The parliament, which had initially approved the appointment, later reversed it unanimously. The European Union has monitored Bulgaria since it joined in 2007 as it works to meeting the bloc's demands on judicial reform, corruption and organized crime. On Prime Minister Plamen Oresharski's inaugural trip to Brussels, Barosso said that he urged him to "consult widely on key appointments, especially in the areas of the fight against corruption and organized crime." "Some of the recent developments in Bulgaria were not good, and they raised concerns not only in Bulgarian society but among the European partners of Bulgaria," Barroso said. "The candidates chosen should be based on merit, and they should have the highest standards of integrity," he added. The technocratic prime minister came to power at the head of a Socialist-led government last month after a snap election followed the resignation of the conservative coalition in February. Since then, however, thousands have been demonstrating against corruption and organized crime while the conservatives are boycotting parliament and demanding new elections. "I will persevere in my efforts to ensure the normalization of the political and public situation in the country," Oresharski pledged, adding that his government took the EU's recommendations seriously. "We will persevere in our efforts to build the confidence of our partners in the EU," he added. For his part, Bulgaria's president praised the protest rallies on Friday, saying that politicians must heed the demonstrators' demands for reform. "Bulgaria can be proud of this good-natured, democratic protest, which delivers a message to the politicians," said President Rosen Plevneliev, who holds a largely ceremonial office. "I very much hope they will be heard and that this time the politicians really take responsible, clear and, I would say, brave decisions," he added. 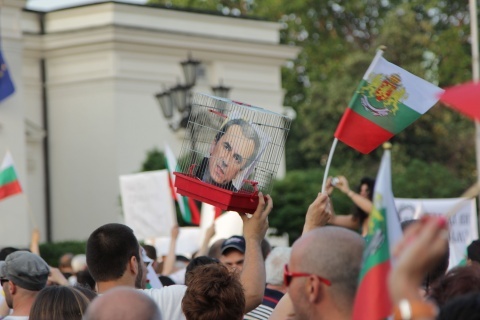 An opinion poll by Alpha Research published this week found that over 80 percent of Bulgarians support the protests, though respondents split nearly evenly on whether the Cabinet should immediately resign. The poll also found that only 23 percent of respondents approved of the new coalition of the Socialists and the ethnic Turkish MRF party, the lowest level for any government since 1997. About 28 percent of respondents to the June 13-18 survey expressed disapproval. Protesters have planned further rallies for the weekend.